Broker Mosquitto has group of topics in which he publishes various information about his work. By subscribing to these topics, we can find out, for example, what the number of subscribers are now, or how many messages have been published or received since the start of the server. If you have previously set permissions for users, you must also provide your login and password. The details described in the previous article. 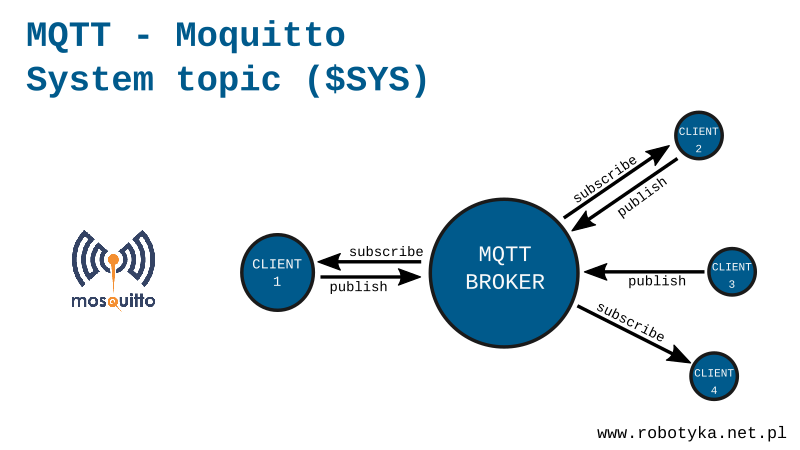 Another useful topic is $SYS /broker/subscriptions/count, Mosquitto publishes the current number of subscribers. Note that the initial published message contains information about the number of subscribers before the command is called, and the next contains only the current value. With this setting, although the value of the parameter is changed, it will not be published in the topic until is no longer 10 seconds from the previous publication. This solution can be useful when you do not need data all the time, so there is no need to additionally load the computer on which it works Mosquitto. For example, entering a value of 86400 (seconds) will cause the data to be published once a day. When you set the sys_interval value to 0, no data will be published. This is how to disable the system topics. All information is published by the broker with the -r parameter so that the new subscriber receives the last-published message during the call. In the article I presented only a fragment of the possibilities of system topics, they are all described on the Mosquitto documentation page. This entry was posted in IoT (Internet of Things), Tutorials. Bookmark the permalink.